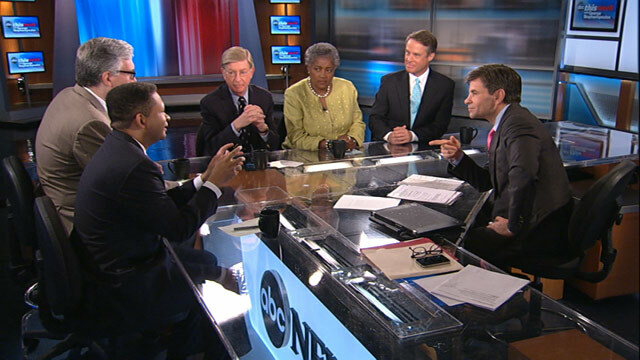 ABC's George Stephanopoulos talks with a powerhouse round table on "This Week." STEPHANOPOULOS (voice-over): Good morning, and welcome to "This Week." Supreme Court history on health care. (UNKNOWN): Today is a tragic day for this republic. STEPHANOPOULOS: A defining moment for the court. OBAMA: Today's decision was a victory for people all over this country. STEPHANOPOULOS: A huge win for President Obama. OBAMA: I didn't do this because it was good politics. I did it because I believed it was good for the country. STEPHANOPOULOS: And a new rallying cry for Mitt Romney. ROMNEY: If we want to get rid of Obamacare, we're going to have to replace President Obama. STEPHANOPOULOS: The big questions: Why did Chief Justice Roberts cast that surprising vote? How will it shape the presidential race? And what does it mean for your health care? We'll ask our headliners, White House Chief of Staff Jack Lew and the chair of the House Budget Committee, Paul Ryan. Plus, our special exclusive guest. OBAMA: I'm signing this bill for all of the leaders who took up this cause through the generations, and it's fitting that Ted's widow, Vicki, is here. STEPHANOPOULOS: Vicki Kennedy. Health care was the cause of her late husband's career. Her reaction here first. And debate and analysis on our powerhouse roundtable, with George Will, Donna Brazile, Terry Moran, Artur Davis, and Keith Olbermann. Chief Justice Roberts has escaped to what he calls the impregnable forest of Malta after delivering a landmark decision on health care that blindsided so many Supreme Court watchers and energized both presidential campaigns. It will also shape America's health care system and constitutional law for years to come. We're going to get into all that this morning. But we begin with something special, the first reaction to the ruling from Vicki Kennedy, the widow of Senator Ted Kennedy, who fought for universal health care throughout a Senate career that spanned almost half a century, a commitment captured in his final convention speech. T. KENNEDY: This is the cause of my life, new hope that we will break the old gridlock and guarantee that every American -- north, south, east, west, young, old -- will have decent, quality health care as a fundamental right and not a privilege. STEPHANOPOULOS: And Vicki Kennedy joins us now. Thank you so much for coming in this morning. V. KENNEDY: Thank you, George. STEPHANOPOULOS: I can only imagine what it must have been like for you at the moment you heard what the Supreme Court had decided. V. KENNEDY: You know, George, as you just heard in that wonderful clip, this health care reform was the cause of my husband's life. He believed that it was a moral issue, that it defined the character of who we were as a society, who we were as a country, and that decent, quality, affordable health care should be a fundamental right and not a privilege. And now all three branches of our federal government have affirmed that right. And I think if Teddy were here, he would tell us now it's time to roll up our sleeves, get to work, fully implement the law, and move on with the business of our country. STEPHANOPOULOS: I do want to get to that, but I imagine Senator Kennedy would have been surprised like so many were by the fact that the deciding vote was cast by Chief Justice Roberts. V. KENNEDY: You know, I don't think he would have. I think he felt very strongly in health care reform. He had studied this issue for more than 40 years. He believed in it. He believed in its constitutionality. He had looked at it in every way. And I think he would have been pleased, but not surprised. STEPHANOPOULOS: And right after the decision, you received a call from Speaker Pelosi saying Teddy can rest. V. KENNEDY: Yes. Yes, it was a lovely, lovely call. She fought valiantly for health care. She led the House of Representatives beautifully in fighting and championing health care for all Americans. She's -- really was a real, real heroine in this battle. STEPHANOPOULOS: You mentioned how the senator would be looking to the struggles ahead. And I want to read a little bit of a letter he wrote to President Obama shortly before he died, where he gets into that. He was quite optimistic. Here's what he said. He said, "I came to believe that soon, very soon, affordable health coverage will be available to all. And while I will not see the victory, I was able to look forward and know that we will -- yes, we will -- fulfill the promise of health care in America as a right and not a privilege." But he did also refer to the continuing struggles. What do you see as the biggest struggle going forward? V. KENNEDY: Well, I think that it's -- we're seeing it right now, really, and it's just continuing to go and implement the law, for all of us to come together. But when people look at each individual provision, it's wildly popular. These are rights and benefits that the American people embrace and are excited about. Families can go to sleep relaxed and happy knowing that their children who have asthma or diabetes or allergies are covered by insurance and aren't barred because they have a pre-existing condition. Seniors know that that so-called doughnut hole, where they didn't have coverage for prescription drugs, is now being filled. We now have preventive care coverage where there's no out-of-pocket payment to get mammograms or colonoscopies or to have cholesterol screenings. These are important benefits. And as people know more and more about these, as they reap these benefits, they embrace them, and it's a very, very exciting day in America. STEPHANOPOULOS: This week will mark the 20th anniversary of your wedding to Senator Kennedy. STEPHANOPOULOS: How are you going to mark the day? V. KENNEDY: Well, I think privately. Privately. STEPHANOPOULOS: Well, thank you for joining us today, and congratulations again. STEPHANOPOULOS: And let's get a little more on the policy and the politics with White House Chief of Staff Jack Lew. Thanks for coming in this morning. STEPHANOPOULOS: Congratulations to you, as well. But as you know, the president's opponents have already seized on the ruling by Chief Justice Roberts that the health care survives because the payment it requires is -- is considered a tax, not a penalty. And they are putting millions behind that message in key battleground states. I want to show it right here. OBAMA: ... is absolutely not a tax increase. (UNKNOWN): Now we know that's not true. Obama's health care law is actually one of the largest tax increases in history. How can we afford this tax? We're already struggling. STEPHANOPOULOS: As you know, President Obama denied all along that this was a tax. Is he now prepared to defend it? STEPHANOPOULOS: You keep wanting to use the word penalty. LEW: It covers 99 percent of the American people. In Massachusetts, where they had a plan like this under Governor Romney, 1 percent did not take insurance and they paid the penalty. Let's be clear about who that 1 percent is. Those are people who can afford health insurance who choose not to buy it, and then when they get sick, they go to the hospital and the costs get spread amongst all the people paying for insurance. So the law set it up as a penalty for people who make that choice. The court found it constitutional. Frankly, what you call it is not the issue. It's what it is. STEPHANOPOULOS: But they said they found it constitutional because it is a tax, not a penalty. Here is the chief justice. Right here, he said, "The shared responsibility payment may for constitutional purposes be considered a tax, not a penalty." LEW: The Supreme Court looked at what the structure of the law was, and they saw that 1 percent of the people would be paying this charge if they chose not to avail themselves of health insurance. But more middle-class people are going to get a tax cut in this law. There's a tax cut of $4,000 for people who need help paying for health insurance. For the very, very few who choose to go uninsured, and who can afford it, and who are saying that if I need health care, it's going to be someone else's burden, it says they have to pay a charge. You know, if you look at the past, since President Obama's been in office, middle-class families have gotten a $3,600 tax cut. In this law, there's a $4,000 tax cut for people who need help paying for health insurance. For that 1 percent who have chosen not to buy health insurance and just to pass the burden onto others, there's this penalty. STEPHANOPOULOS: But you do concede -- and you keep wanting to use the word penalty -- you do concede that the law survived only because Justice Roberts found this to be a tax? STEPHANOPOULOS: But the argument of Chief Justice Roberts is that it's a tax. LEW: He -- he went through the different powers that Congress has and he found that there is a power, whatever you call it, to assess a penalty like this. STEPHANOPOULOS: He called it a tax. So you're conceding that? LEW: I'm saying that it was set up as a penalty for people who choose not to buy insurance, even though they can afford it, and for that 1 percent, we call it fair. STEPHANOPOULOS: And he calls it a tax. I'm going to move on now at this point. The court also ruled that the federal government can't take away a state's Medicaid funding if it refuses to go along with the expansion of coverage. That could affect up to 17 million people who would have been covered by the expansion. And we've already got a lot of governors signaling that they're going to turn down the expansion because of that. That could mean millions fewer covered. How much does that worry you? And what can you do about it? LEW: Well, to be clear, the extension of Medicaid coverage for those who can't afford it was upheld, and states are now in a position where the federal government is saying, we will pay 100 percent of the cost of covering those people. In the 1960s, when Medicaid was enacted with a much smaller federal share, where the state had to actually pay a considerable amount, the states all ultimately came in. STEPHANOPOULOS: So you think these governors are bluffing when they say they won't? LEW: In -- in -- in 1997, when the child health program was expanded, still the match was -- required states to pay something, the states came in. It's 100 percent federal. And I believe that the states will come in. STEPHANOPOULOS: It goes down to 90 percent after several years. LEW: It goes down to 90 after several years, but it is the most generous federal match in the history of Medicaid. And I think a governor's going to have to answer to their own people. The vast majority of states will come in. For those few that are slow to come in, they're going to have to answer to people why they're turning this down and why they're letting people go without coverage. STEPHANOPOULOS: Governor Bobby Jindal of Louisiana suggested that perhaps if you make those Medicaid payments a block grant, he would accept the funding. Is that something you can go along with? LEW: You know, I think that there's been a debate about Medicaid going back many years. We think that it's important to protect Medicaid as something that people have a right to in whatever state they're in, and there have to be some requirements that states meet in terms of who's covered and what's covered. I think this law expands coverage. It's a good thing. And the states should implement it. And I think most states will. STEPHANOPOULOS: You know, let's turn to the politics a little bit. Individual parts of the plan are still popular, as Vicki Kennedy said, but the overall plan isn't. And that seemed to energized Governor Romney and his supporters. I want to show you something he said on Friday. ROMNEY: The American people didn't want it in 2010. That's one of the reasons we picked up so many seats in the House and Senate. And -- and I think in the election this November, people who know they don't want Obamacare will have to vote out President Obama. And that's a plus for me. STEPHANOPOULOS: You see that, he says it's a plus for him. Can President Obama now do what he hasn't been able to do yet and turn it into a political plus? LEW: You know, I think if you look at where we are now versus where we were a couple of years ago, the American people are starting to experience the benefits of this law. For students who are getting out of college and didn't have a job, they can stay on their parents' health plan. For senior citizens who were paying $600 in what was called the donut hole, the Medicare, that's now something that they don't have to pay for. For families with children with pre-existing conditions, they don't have to worry about lifetime limits or about whether those pre-existing conditions means that they won't have insurance. This is something that will provide security and protection for America's families, and they're beginning to see it. They're beginning to experience it. I think that the American people do not want to go back to a divisive debate about health care. The Congress passed the law. The Supreme Court ruled it constitutional. The arguments that are being made now to reopen that fight are the wrong arguments. What we need to be doing is focusing on growing the economy and growing jobs for the middle class. STEPHANOPOULOS: So you don't think this election is a referendum on the president's health care plan? LEW: I think this -- this election will be about the economy. The American people are focused on the economy. They're asking the question, what are we doing to get it going? The president's proposed things that Congress should act on, that would put teachers, firemen, and -- and policemen back to work, that would take veterans and help them get jobs. It would help people who are underwater refinance their homes. If the president's plan had been enacted, there would be a million more jobs. Congress should get to work on those things. And, you know, frankly, when you look at the choices right now, right now the debate is going to be about very different visions of the future. You've got a Republican tax plan that would provide $5 trillion of benefits, mostly to people earning over $1 million, and how would it be paid for? Independent studies have shown that the only way to do that without creating a bigger deficit would be to cut tax benefits that go to middle-class families, things like the mortgage interest deduction, the health exclusion, and charitable contributions. STEPHANOPOULOS: And I'll ask Congressman Ryan about that. But before we go, I want to ask you one more question. I wonder what the president makes of the fact that this legislation was saved by Chief Justice Roberts. I mean, he clearly voted against confirming Roberts because he said he wasn't sure that the justice's heart would be in the right place, would be the right guide in tough cases, and he went on to say this. OBAMA: I hope that I'm wrong. I hope that he'll recognize who the weak and who the strong are in our society. And I hope that his jurisprudence is one that stands up to the bullies of all ideological stripes. STEPHANOPOULOS: So does the president now believe that he was wrong about Roberts? LEW: Well, I can't speak to the vote many years ago. I can tell you that this was a good week for the Supreme Court. It was a decision made on law. It was a decision where the court did not make itself the legislature, where a path was found to put different views together to rule a law constitutional which we believed from the start was constitutional. So it was a good day for the American people. STEPHANOPOULOS: So the president has some thanks to Chief Justice Roberts? LEW: Well, it's a good day for the American people. STEPHANOPOULOS: Jack Lew, thanks very much. STEPHANOPOULOS: Let's turn now to Congressman Paul Ryan, the chair of the House Budget Committee. Congressman Ryan, thanks for coming in this morning, as well. You just heard Jack Lew on Chief Justice Roberts and the good week, he said, for the American people. Many of your Republican colleagues in the House and conservative allies have been far more critical of the justice. The National Review calls it Chief Justice Roberts' folly, says that Chief Justice Roberts cannot justly take pride in this legacy. Jack Kingston, your colleague in the House, "I feel like I just lost two great friends, America and Justice Roberts." And then we saw Glenn Beck -- he's trying to sell this T-shirt calling Chief Justice Roberts a coward. What do you make of this criticism? And do you agree with it? RYAN: Well, yeah, I'm very disappointed in the ruling. I think the chief justice had to contort logic and reason to come up with this ruling. And basically, in his summary comments, he basically said the Supreme Court's not going to do this. They're not going to strike it down. We're going to leave it up to the American people. So one man decided against the dissenting opinion, against what I, you know, thought were his -- his principles and judicial jurisprudence, he decided to leave this up to the American people. So now the stakes of this election could not be higher, George. So, yeah, I'm very disappointed, but we're not deterred. We think we can still repeal this law if we win this election. And that's basically what the chief justice said. It's now up to the American people. It's beyond Congress, the president, and even the Supreme Court. The American people will be the judge and jury of this law come November. STEPHANOPOULOS: Governor Romney has said in the past that Chief Justice Roberts is a model for the kind of justice he would appoint to the court. Does that still hold? RYAN: Well, I don't agree with his ruling. I agree with the dissenting judges. I think they basically had to rewrite the statute in order to call this a tax. He -- he did have some good principles, which is the Commerce Clause and necessary and proper clause, meaning there is a limit to what Congress can do to affect people's behavior. But if you call it a tax, you can tax anybody to do anything you want from government, apparently. That to me is a disturbing ruling. That to me is rewriting this law. And that means they just punted it to the American people, and they will have the final say-so this fall. We will repeal this law if we win this election. STEPHANOPOULOS: And it is -- it is in the campaign right now. Governor Romney continued that campaign for repeal right after the decision. I want to show a little bit of that. ROMNEY: Obamacare raises taxes on the American people by approximately $500 billion. Obamacare cuts Medicare -- cuts Medicare by approximately $500 billion. STEPHANOPOULOS: You know, several independent fact-checkers have taken a look at that claim, the $500 billion in Medicare cuts, and said that it's misleading. And in fact, by that accounting, your budget, your own budget, which Governor Romney has endorsed, would also have $500 billion in Medicare cuts. RYAN: Well, our budget keeps that money for Medicare to extend its solvency. What Obamacare does is it takes that money from Medicare to spend on Obamacare. I mean, I've heard for years how much people don't like the idea that we're raiding Social Security to pay for other government programs. What Obamacare does for the first time in history is it raids Medicare to pay for Obamacare. In addition, it puts this new board of 15 people in charge of putting price controls on Medicare, which we think will end up rationing Medicare in ways that will deny care to seniors. So not only do we think this law is bad for Medicare, it's bad for health care, it's terrible for the economy, and it will move us closer toward a debt crisis. STEPHANOPOULOS: Correct me if I'm wrong, I thought your Medicare savings were put towards deficit reduction and debt reduction. RYAN: It -- which -- which extends the solvency of Medicare. What they do in Obamacare is they try to count this dollar twice. They claim that this helps Medicare solvency and, at the same time, they spend this money on creating Obamacare. If you look at the appendix of the Trustees Report for Medicare, they -- they say the same thing. You can't count these dollars twice. In our budget, we make sure that all these dollars from Medicare savings go toward extending the solvency of Medicare and don't go toward spending new money on Obamacare. So we don't raid Medicare for Obamacare. We repeal Obamacare and extend the solvency of the Medicare trust fund in our budget. STEPHANOPOULOS: So you reject the charge that this could open up to the charge of hypocrisy? RYAN: No. Look -- look at the hypocrisy. The president on your show said this is not a tax. Then he sent his solicitor general to the Supreme Court to argue that it is a tax in order to get this past the Supreme Court. The broken promises and the hypocrisy are becoming breathtaking from the president who says one thing to get this past Congress and then another thing to get it past the Supreme Court. Look, I was here fighting this bill, George, in the last session of Congress. Believe me, if this was brought to the public as a tax, there's no way this law would have passed into law in the first place. That's what's so frustrating and disappointing with this law. STEPHANOPOULOS: I think you may be right about that. You also heard Jack Lew and Vicki Kennedy talk about the provisions in the law, some of them already in place, which are relatively popular right now with the American people. This is what's up on the White House website, that you can't deny coverage due to pre-existing conditions, can't charge women more than men, can't place a lifetime dollar limits on care, must cover young adults under age of 26 on a parent's plan. And I know the House is scheduled to have a repeal vote a little later this month. When you do that, will you also vote to preserve any of these programs? Or does everything go? RYAN: Well, we -- we will vote to repeal the entire law on, I believe, July 11th. And what's frustrating about this is, when Obamacare was being deliberated, we were offering patient-centered solutions. I'll just say this. We can have a health care system in America where everybody has affordable access to health insurance, including people with pre-existing conditions, without a government takeover. And those are the kinds of patient-centered solutions we're going to be advancing. We were proposing them then. We're proposing them now, so we can address these very legitimate concerns without a complete government takeover of 17 percent of our economy. STEPHANOPOULOS: But to -- to be specific, those provisions that are already in place now, like closing the doughnut hole, covering young adults under the age of 26, not placing lifetime limits on care, those are all going to go in the House vote? You're not going to vote to replace them? RYAN: We're going to repeal the entire law, and then we're going to advance patient-centered reforms which address these kinds of issues. By the way, the market was already moving on, say, the 26-year-old. Insurance companies were already announcing they're going to keep that in place anyway. STEPHANOPOULOS: So you're not going to require it. RYAN: So if you allow the market to work to appeal to consumers -- no, but what I would say is, if you take a look at a lot of the comprehensive plans many of us have authored, it does address these things. What I'm trying to tell you, George, is we can address these legitimate problems and needs without a government takeover. I think this, at the end of the day, is a big philosophy difference. What -- what Mrs. Kennedy and others were saying is this is new government-granted right. We disagree with the notion that our rights come from government, that the government can now grant us and define our rights. Those are ours. Those come from nature and God, according to the Declaration of Independence, a huge difference in philosophy. And so what we're saying is, there are principles and reforms that we could have passed into law, which we still want to, that address these legitimate problems without putting the government in such a central role in our lives and in our economy, which we think is going to hurt our economy, bring us toward a debt crisis, and -- and make the American health care system that much worse. STEPHANOPOULOS: Finally, I asked Jack Lew this. Will this election turn on health care? RYAN: Health care and the economy. Look, this is the most important election in our lifetimes. This ruling -- and I guess this was John Roberts' thinking -- he raised the stakes of this election higher than it could have been raised. This election is a choice of two futures. Do you want a government-centered society in a government-driven economy and government-rationed health care? Or do you want the American opportunity society with a safety net, a free economy, economic freedom, personal liberty? That's what we want. That's the American idea. We have one more chance as a people to get that back, and that chance is going to come on November the 6th. STEPHANOPOULOS: Big choice ahead. Congressman Ryan, thanks very much for your time this morning. STEPHANOPOULOS: And coming up, so much to debate and analyze on our powerhouse roundtable. The court on Obamacare. FALLON: Nancy Pelosi wore her lucky purple shoes for the Supreme Court's health care ruling, while House Speaker John Boehner wore his lucky orange face. STEPHANOPOULOS: Plus, Obama and his team accuse Romney of outsourcing jobs. Fair hit or false charge? BIDEN: You've got to give Mitt Romney credit. He's a job-creator, in Singapore, China, India. BARACK OBAMA, PRESIDENT OF THE UNITED STATES: For us to say that you've got to take a responsibility to get health insurance is absolutely not a tax increase. GEORGE STEPHANOPOULOS, ABC HOST: But it may be fair, it may be good public policy. OBAMA: No, but, George, you can't just make up that language and decide that that's called a tax increase. STEPHANOPOULOS: I don't think I'm making it up. "Merriam-Webster's Dictionary", "tax: a charge, usually of money, imposed by authority on persons or property for public purposes." OBAMA: George, the fact that you looked up Merriam's dictionary, that the definition of tax increase, indicates to me that you're stretching it a little bit right now. STEPHANOPOULOS: I wanted to check for myself, and your critics say it is a tax increase. OBAMA: My critics say everything's a tax increase. STEPHANOPOULOS: But you reject that it's a tax increase. STEPHANOPOULOS: Apparently Chief Justice John Roberts does not. And you saw that debate continues this morning. We're going to keep going on our roundtable, joined as always by George Will; Donna Brazile; our Supreme Court reporter Terry Moran; Artur Davis, former Democratic congressman, now a Republican, supporting Mitt Romney; and, of course, Keith Olbermann. George, let me begin with you. There are so many ironies in this case. You know, you saw President Obama's signature legislation upheld by a chief justice he opposed with an argument (inaudible). You had one more. You say that this is a major victory for conservatives. GEORGE WILL, AUTHOR: Yes, and I'll tell you why. The conservative legal insurgency made two arguments, both of which were dismissed as frivolous by the liberal law school professoriate, both of which won. Both were the broccoli argument, the Tea Party argument, if you will, argument against the Commerce Clause, said if you affirm this under the commerce clause, you will have given the federal government a general police power to prescribe mandate or regulate behavior of every individual at every instance of their existence. The court did not do that. In fact, it built a fence around the Commerce Clause. Then, on Medicaid expansion, for the first time in history, a majority of states banded together to challenge the constitutionality of legislation and they won. For the first time since the New Deal, 75 years, the Supreme Court has overturned a federal spending statute (inaudible) by coercing the states, it undermines the dual sovereignty that is the heart of our federal position. So for two reasons -- and these reasons are going to be there if, come November, there's a Romney presidency, and a Republican Senate, ObamaCare will gone. The Roberts precedents will remain. STEPHANOPOULOS: Price worth paying, Keith Olbermann? KEITH OLBERMANN, POLITICAL COMMENTATOR AND WRITER: I think so, because we may be overthinking this from a larger standpoint in this country. The premise of the mandate as tax or tax as mandate, the various subdivisions of what the meaning is, aren't -- they're important to us; they're important to people analyzing this. To the public, the outcome was something the president proposed was upheld. Also in a larger sense, if you think about what is a mandate, do we have them? Are they -- is this taxation possibility for non-users legitimate? Every day in our lives we are subjected to the largest mandate any of us could ever have. We have to buy a product each day called the United States government. That mandate supplies everything from wars that we don't go along with, to solicitor generals we disagree with, to the salaries of the Supreme Court justices. So I think if you look at this from a layman's point of view, I think it's a pretty clear-cut victory for the president. ARTUR DAVIS, FORMER CONGRESSMAN: No, I don't think it's a victory for the president. Though I do agree with Keith's point that the average person is not going to get caught up on the legal nuances. The bottom line is that a law that is the single least popular piece of domestic legislation and, arguably -- you know, George is the history maven here, but arguably since 1938, this is the least popular domestic legislation that's passed. I remember when the debate was going on in 2009 and 2010, the Democratic mantra was, well, as soon as this has the legitimacy of being signed into law, people will decide they like it. They'll give Democrats credit for a win. Now, I hear my Democratic friends saying, well, now that it's been given the imprimatur by the Supreme Court, that will somehow give it legitimacy. The people who don't like this law, the independents, conservative Democrats and swing voters who don't like it, they don't dislike it because of their constitutional jurisprudence. They're not carrying one around. They dislike it because they think it costs too much money, they think it's unpredictable, they think it goes further than it needs to, and I don't see any of those doubts going away, especially when a significant part of this law still doesn't go into effect for another four years. DONNA BRAZILE, VICE CHAIRWOMAN, DEMOCRATIC NATIONAL COMMITTEE: Well, I don't believe that people dislike it because it's an overreach of government or for many Democrats who dislike it, it didn't go far enough. We didn't achieve a single-payer option. We will see just how bold the Republicans will be if they manage to try to repeal and then replace it. We know that they've already -- in the House they voted already last year to try to repeal -- repealing it as a job-killing act, and then there's another vote scheduled as Mr. Ryan said in a few weeks. But look, George, the big issue is that this was a moral victory for the country in large part because we have millions of Americans today who are already enjoying the benefits of this act, whether it's senior citizens who are paying less for their prescription medicine, young people, 3 million or more who are still on their parents' insurance up until the age of 26. And, of course, I'm no longer a pre-existing condition as a woman, the majority of the population. So the Republicans will continue to make their arguments. And many of them are misleading. But Democrats will have to continue defending. STEPHANOPOULOS: And I want to get to more of the politics in just a minute. Before we get to this, let me turn to Terry Moran, who covers the Supreme Court for us and talk a little bit more about the role about Chief Justice Roberts. The vote did surprise a lot of people, even some suggestions that he switched his vote some time in the last couple of weeks. TERRY MORAN, ABC CORRESPONDENT: It's fascinating, George. This opinion is a detective story. If you read it, you see the clues that something happened. It looks like Chief Justice Roberts switched his opinion. STEPHANOPOULOS: And he voted the first 12 or so pages of the dissent. MORAN: Right, and then couldn't go along with the conservatives who wanted to strike down the whole law, because if you think that some of Chief Justice Roberts' opinion is logically torturous, read the dissent on striking down the whole law. They plow through lots of precedent in order to do that. But not for the first time here. MORAN: -- this is a very significant victory for conservatives. From now on, liberals who want to use the federal government in innovative and creative ways, unprecedented ways to solve problems are going to be playing defense at the Supreme Court. STEPHANOPOULOS: And, George, you and I were both struck by this article by Charles Lane in "The Washington Post," saying that this compromise that Justice Roberts fashioned is actually true to his deepest principles. WILL: Exactly. Three things about Justice Roberts: he's not a fool, he's not a liberal and he's 57. He's going to be here for 20 more years, at least, through three or more presidencies. And he's going to be building upon new ways of circumscribing the latitude of Congress in particular, but the federal government in general. STEPHANOPOULOS: -- a tax, isn't it? DAVIS: Actually, it's not. Because what will happen in the future, especially if you're on the liberal Democratic side of the equation, it is always easy to say -- it's hard to tax people. It's not hard to tax companies. After Justice Roberts has pumped up the taxing clause, I can imagine a future Democratic administration saying let's scrap the corporate tax code, announce we'll have a corporate tax code that says we're going to have a 10 percent rate for companies who don't outsource and a 35 percent rate for companies that do. And you think of all kinds of examples. DAVIS: That's the point. It would pass, and it would be an incredible intervention in the free market economy of this economy. So I think this idea that somehow Chief Justice Roberts has said we're going to cut down the Commerce Clause, the reality is -- there's a reason these mandates don't tend to happen (ph). WILL: Most conservatives are much more frightened of an unlimited Commerce Clause than they are of a somewhat theoretically expanded taxing power. Just to give you one example, if this had been called a tax during the congressional debate on Obamacare, it would have fallen five or more Senate votes short of passage. Ben Nelson, Mary Landrieu and a whole bunch of others would not have passed it. DAVIS: Well, maybe, George. But I think the problem is, again, let's go back to the outsource example. I'm with George Stephanopoulos here. It will always be easy for Congress to go after certain industries and to distort the market by saying something that previously the court has not said. MORAN: They do that all the time. They tax gas guzzlers, they tax liquor, they tax alcohol, they tax tobacco. The tax code is used to shape behavior. DAVIS: Stronger power now than it was before. MORAN: Yes, it is, but this court will limit that. DAVIS: Well, we don't necessarily know that. STEPHANOPOULOS: And Keith, are you worried about the tax argument in the election? Now that Chief Justice Roberts has said firmly this is a tax. You already see the Republicans advertising on it. OLBERMANN: Again, I think it's got to be a concern for the president that wasn't there before this terminology was used. But this was already such a huge issue in terms of this divide between people who are opposed to the Obamacare concept and yet support each aspect of it. It was already such a hot-button issue that had very little to do with the facts that I don't think this is going to be muddied further. STEPHANOPOULOS: Is there anything, though, that the president needed -- to Artur's point about independent voters who have been skeptical of the law? Can he now use this? OLBERMANN: Well, he can now point out that it did get the imprimatur of the Supreme Court, that's the easiest thing for people who are not in this the way we are, to understand. In addition, Governor Romney is now not only running against a program very similar -- everybody would have to admit it -- at least very similar to the one he engineered in Massachusetts. He's not only doing that, but he also has to say that he is opposed to the decision of somebody who was, until this week, perceived as a supremely -- no pun intended -- conservative chief justice. That can't be a win for him. He has two now insurmountable or nearly insurmountable problems when he only had one when the week began. WILL: I think this probably helps Mitt Romney for three reasons. You have already seen him argue that to remove Obamacare, you have to remove Obama. That's key. Second, he said this is now -- we have a president who has imposed a substantial tax on the middle class in violation of his promises. But most important, the Romney campaign has been so far pretty much a one-trick pony -- the economy, the economy, the economy. This gives him an added repertoire to talk about. BRAZILE: I don't think it helps Mitt Romney at all. Because, Keith is right, this was one of his signature issues as a governor in 2006 when he signed this into law in Massachusetts. Obamacare is Romneycare at a federal level. If it's a tax or a penalty in Massachusetts, well, it's a tax or a penalty, because the IRS, if you fail to obtain -- opt out of health insurance, then you'll be penalized. Look, tax is one of those -- the word tax is something politicians from both sides try to avoid. So maybe we should call it a penalty, call it something else. STEPHANOPOULOS: You can't anymore, though. BRAZILE: Don't tax me, don't tax you, tax that man behind the tree. DAVIS: Before we get to the politics of it, here's the policy irony of all this. Defenders of this law are celebrating a victory on the mandate, which by their own estimate might affect 1 percent of the population. They're glossing over the ruling a few days ago which wipes out the Medicaid provisions. Here's where that's important -- 50 percent of the number of the reduction of the uninsured, the number that the administration says will be the new rate of the uninsured after this, 50 percent of that reduction would come from expanding Medicaid, making the states have to cover the newly expanded class, while the Supreme Court stripped that power away. MORAN: But this is a crucial point. A law that is this big and this complex is going to require the confidence and the cooperation of the American people and the states. If you have a political agenda of massive resistance to it, which is what we're about to get, it will not work. STEPHANOPOULOS: Let me say it works both ways. DAVIS: A lot of people know, a lot of low-income people who believe, because of all the political arguments being spend them the last week, well, they think they've got coverage now. They're going to find that if they live in Alabama, Mississippi, Louisiana, where their governors turn it down, they're not insured. Three years from now, they'll have less confidence in government. WILL: And many will turn it down. Mr. Lew, a few months, said few will do this, turn it down. You're a governor and you're facing your state universities being pruned all across the board, you got a choice, do I expand Medicare, Medicaid rather, or do I protect my public universities? I think more governors are going to resist this. STEPHANOPOULOS: You guys point out the resistance, Keith. I want to bring to you, the flip side, all of those popular provisions. Jack Lew and Vicki Kennedy talked about it. I think make it very difficult to see an actual repeal take hold even if Mitt Romney wins. UNIDENTIFIED MALE: You don't agree? OLBERMANN: Well, I'm not sure because it's politics, I tend to be a little cynical about it. People will -- against their own interests, against the interests of the people in their states, as we've been discussing here, these governors will turn this money down even though it is 100 percent federal expenditure to begin with, and then a 90 percent federal expenditure. They'll still turn it down for the political victory. WILL: I'm going to give you another focus of resistance. The chief justice said this is a tax not a penalty, because it's not sufficiently punitive. It's not sufficiently punitive because it's still a smart move to pay the tax, penalty, rather than the much more expensive decision of buying health care. Therefore, Congress may soon find that it has to increase the -- that word again -- tax, to change this behavior and I don't see them doing that. DAVIS: Isn't this more sticker shock? Again, four years ago, we heard that if you pass this legislation, premiums would go down. They've gone up and they're projected to go up 5 percent each year for the next seven years. We heard two years ago, if you pass this legislation. the ranks of insured will disappear. Because these governors and many of these are going to turn down the Medicaid money, that's not going to happen. And we heard that long term this was going to end up reducing the deficit, no one believes that anymore. BRAZILE: It will increase the deficit by $230 billion and full implementation will reduce the deficit over a ten-year period, because look, we only implemented just a few portions of the law. Many small business owners, like myself -- I mean, when we're able to go into the exchange, the marketplace, to find more affordable insurance for our employees, that's also going to bend down the cost of health care. So, we're just looking at a few, what I call very important and very popular pieces that have been implemented. But let's look at it when the implementation happens in 2014. MORAN: And there's something that better than nothing. The Democrats can stand up now and say never again, under this law, will an insurance company be able to deny you or your loved one coverage for pre-existing conditions, or cut you off because you're too sick. They were against it and they don't have a plan to fix it. OLBERMANN: And it speaks to something fundamental about the nature of any government. We all agree, conservative, liberal, everybody in between, that the primary function of any government is to protect its citizens. We usually think about this in terms of the Department of Defense. It now becomes, as the world situation becomes more secure, in many respects more secure the primary part of that is what happens in hospitals? If you've ever spent a lot of time in hospitals, with people and talk to people in waiting times as I did when my dad was sick for seven months in the surgical ICU, I saw everybody in that hospital. I saw patients, I saw families trying to decide whether or not they could afford he same care that my dad as a vet got for $800. And anything that moves the ball towards this primary role of our government protecting its citizens will be viewed in a generic sense and in a general sense, as a positive thing. And those who stand against it will probably suffer if not in the short term but the long term. STEPHANOPOULOS: I want to move on to another point right here, before we go on to some other issues. In the interest of fairness, we were pretty tough, not everyone here on our roundtable, on Donald Verrilli, the solicitor general, after the oral arguments. He clearly took it heart. Watch this at the Columbia Law School commencement. DONALD VERRILLI, U.S. SOLICITOR GENERAL: Let me just say on that point, that if people say that there's no such thing as bad publicity, have no idea what they're talking about. There is definitely bad publicity -- being on the wrong end of a Jon Stewart monologue is bad publicity, especially when you're the solicitor general. UNIDENTIFIED MALE: Or Keith monologue. STEPHANOPOULOS: George Will, in the end, Chief Justice Roberts took the lifeline that Donald Verrilli gave him. WILL: Yes, he did. It's a lifetime that was extended a long time ago Harlan Stone, to Frances Perkins. They were trying to figure out, in late December 1934, how to fund Social Security and to make it constitutional. At that tea held Wednesday afternoon in Stone's house, he leaned over to Frances Perkins and whispered in her ear, "It's the federal taxing power." WILL: Before leaving this subject, though, while we're in the midst of this liberal celebration of John Roberts, let me say the following then: prophecy is optional folly but I'm going to commit it. One year from right now, after the next term of the Supreme Court, we are going to be talking about the Roberts' court having overturned a racial preferential system in Texas -- admission at a University of Texas, across their entire system, overturning Section V of the Voting Rights Act of 1964 as anachronistic infringement of American federalism, and overturning and further deregulating American politics in the spirit of that wonderful decision Citizens United. MORAN: I do. He's playing the long game here. Those are the issues that he personally as a justice cares about. When issues of affirmative action and racial preferences come up, you hear John Roberts get an edge in his voice. WILL: The sort of business of divvying us up by race. BRAZILE: Before this week, his legacy was Citizens United. BRAZILE: And I will always take a dim view of Justice Roberts. But this is one progressive that's not there. DAVIS: Let me slip in here for a moment, I'm not as confident, Terry, as you and George are on what John Roberts is going to do with any of these cases for a very simple reason. John Roberts exposed this week that he's very attentive to elite public opinion in Washington, D.C. and the attentiveness to elite public opinion is going to pull him up on affirmative action the way it did Sandra Day O'Connor. It's going to constrain him on the Voting Rights Act. The reality is, we don't know, and I guess but we should know because these guys and ladies are supposed to be reading opinions and listening to the arguments and being independents. STEPHANOPOULOS: I want to weigh in here. Because I think the answer to you comes from John Roberts himself in his senior thesis about Daniel Webster quoted by Charles Lane where he said that the man of character did not fight in the thick of political battles but rather raised himself above the conflicts and still through dispassionate compromise. That's the value that he showed. He was acting on this week. George, I want to add one more piece to your litany, what about gay marriage? I wonder if Justice Kennedy sticking with the conservatives this time around on health care means he will free himself up to approve gay marriage? WILL: It could be. Justice Kennedy, I think, is much more understood. Because he's sometimes there and sometimes there, people say he's somehow squishy or unprincipled. I think he's driven in both directions by a constant compass and that is he's a libertarian. And the libertarian dimension of him may cause him to be the fifth vote, it won't be sixth, the fifth vote for gay marriage. DAVIS: Underscoring the point, conservatives are wrong to depend on courts. You've got to go to public opinion when the argument is on public opinion, which is happening by the way in 36 states on gay marriage and it's happening by the way in the context of health care. The argument of public discourse is being won by conservatives. STEPHANOPOULOS: And I want to get one other issue before we go, and that was this outsourcing debate that we referenced already. Both sides advertising on it right now in the battleground states. NARRATOR: Romney's companies were pioneers in shipping U.S. jobs overseas, investing in firms that specialized in relocating jobs done by American workers to new facilities in low-wage countries, like China and India. Does Iowa really want an outsourcer-in-chief in the White House? NARRATOR: Barack Obama's attacks against Mitt Romney, they're just not true. But that's Barack Obama. He also attacked Hillary Clinton with vicious lies. HILLARY CLINTON, THEN-PRESIDENTIAL CANDIDATE: So shame on you Barack Obama. STEPHANOPOULOS: Not the last time we're going to see that. And Keith, Democrats have been definitely making headway in this argument. You see that in the polling, but Romney is fighting back hard. And I want to quote -- Factcheck.org has weighed in and said they found no evidence that Bain shipped jobs overseas while Romney was in charge. OLBERMANN: Well, we would of course have a much cleaner and more enjoyable political system if Factcheck.org were in charge of everybody's campaign, but it's not likely to happen. I'm going to read a tweet from an unusual source this morning that may say something about all of this. Mitt Romney last week, "tough o for Obama, Chicago pros will be hard to beat unless he drops old friends from team and hires some real pros. Doubtful." I'm quoting Rupert Murdoch. Which is by the way, it's rather unusual for me. STEPHANOPOULOS: What was that about? What precipitated that? OLBERMANN: If you read his tweets, you'd know there's no telling what precipitates his tweets. But it speaks to a perception. And I don't know how far it is, I'm not a business analyst. I don't know if Mr. Romney did good things at Bain Capital. But I do know that this is the wrong time to be running as a businessman. It's become something of a dirty word. MORAN: This kind of businessman in particular. It speaks to a deeper anxiety out there. One of the things the Obama campaign is trying to do is put the entire era of hyperfinance that we have lived through on trial. And a question that Samuel Huntington, the late Samuel Huntington asked, where are the loyalties of the people at the top of American capitalism today? Are their commitments to the local communities or to their counterparts in Germany and Hong Kong and elsewhere? And that is a real question. WILL: Peter Hart, a very wise and seasoned Democratic poll taker says if you go back to every election since the Second World War, starting with Truman, with the exception of Nixon, the winner in every election is the most likable. So the question is not whether the outsourcing is valid, is good economics, the question is, does it make Mr. Romney less than approachable and friendly? STEPHANOPOULOS: And that's a big challenge coming up. We're going to talk about it more in coming weeks. Thank you all, that was a fantastic roundtable. Your voice this week is coming right up. But first, three moments from this week in history. What year was it? An open mike caught President Reagan joking about the Cold War. REAGAN: My fellow Americans, I'm pleased to tell you today that I've signed legislation that will outlaw Russia forever. We begin bombing in five minutes. STEPHANOPOULOS: Apple launched its new MacIntosh computers with ads on "This Week." UNIDENTIFIED MALE: If you can point, you already know how to use it. STEPHANOPOULOS: And during the Super Bowl. BARBARA WALTERS: Religion and politics are necessarily related. Are you comfortable with that? STEPHANOPOULOS: And Senator Bob Dole issued a warning about politics mixing with religion. DOLE: I think we're near the edge. STEPHANOPOULOS: Was it 1982, '83 or '84? We'll be right back with the answer. STEPHANOPOULOS: So, what year was it? Apple came out with the MacIntosh and Ronald Reagan had that memorable open mike moment 28 years ago, 1984. And in your voice this week, today's question comes for Scott Wallace. "How do most political strategists keep their professional loyalties separate from personal friendships with people working in the same industry? Do you, George, have good friends that are very different from you politically?" The short answer is yes, I couldn't imagine otherwise, because you know, politics just can't overwhelm all the rest of life. And of course, one of the best examples of opposing strategists overcoming their political differences, my friends James Carville and Mary Matalin, still going strong 20 years after the 1992 campaign where they fought each other professionally to the end. Congratulations. They're going to be on the show in a couple of weeks. I don't think it would hurt to see a few more friendships and more across party lines. That's all for us today. Check out "World News with David Muir" tonight. And thanks for sharing part of your Sunday with us. Have a fantastic Fourth.